How can I renew my subscription for Parallels Access? I would like to renew my subscription for Parallels Access. I am logged out of Parallels Access 5 minutes after launching the application. 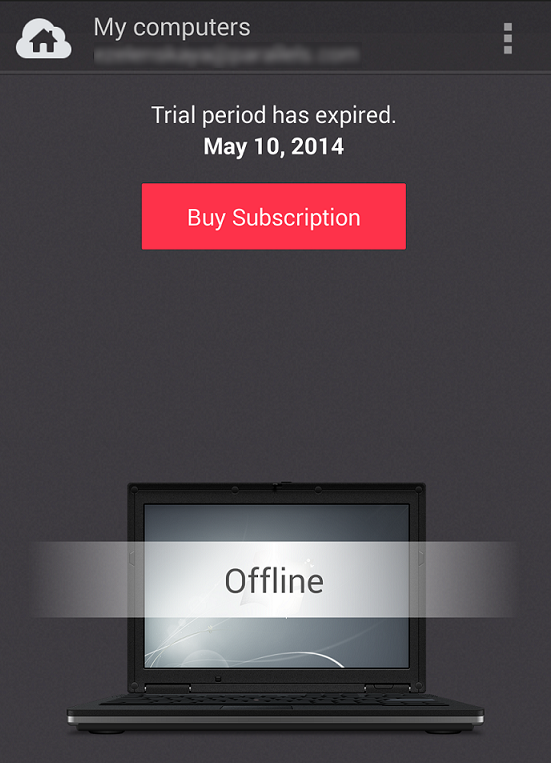 I receive an in-app notification that my subscription has expired. 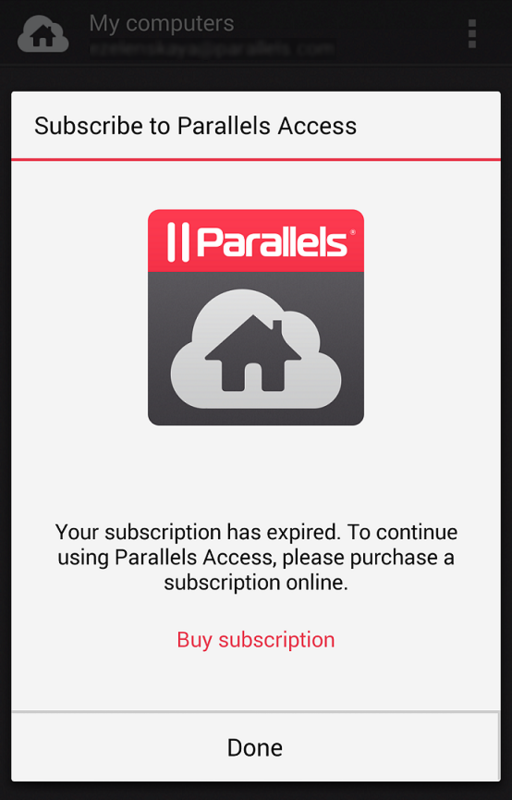 If your Parallels Access subscription is expiring or expired, you will see a Buy Subscription button on your screen when you log into Parallels Access on your mobile device. Click the button to complete a secure purchase. Note: you need to wait till your current subscription expires to purchase a new one. You can renew your Parallels Access subscription in three ways, depending on what mobile device you are using. The Buy Subscription button is displayed on top of the screen of your iOS based device. If you click the button from within your Parallels Access application installed on an iOS based device, you will need to complete the purchase at the Apple App Store. Select a plan, depending on whether you would like your subscription to be renewed yearly or monthly. Parallels is unable to process any requests for direct purchases or refunds for an App purchased through the Apple App Store. Click the Buy Subscription button on your Android based device to start the renewal. 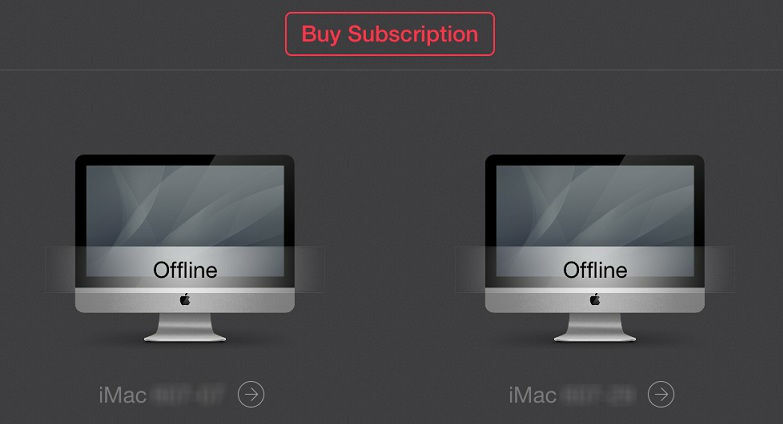 If auto-renewal for your subscription is turned off, you will see a new window, suggesting to manage the option. Click Manage auto-renewal settings and you will be redirected to your Parallels account, where you can enable auto-renewal, so that the subscription is renewed automatically. If there is no auto-renewal option for your subscription, you will see a new window with another Buy subscription button, click on it. You will be redirected to the Parallels Access page of your Parallels account. Then the purchase process is the same as if you purchased the subscription from My Account page using any other device. Detailed instructions are available below. To renew a subscription from your Parallels Account at https://access.parallels.com/, log in to your account. You will see a Buy Subscription button on the right of the screen, click on it to start a purchase process. You will be redirected to the shopping cart, where you should select the subscription plan - monthly or annual. Proceed to the next page, fill in your contact information and allow some time for the order to be processed. Detailed instructions on purchasing Parallels Access from different devices are available in this article.